Kristen Visbal, the artist who sculpted "Fearless Girl," has been quietly selling full-size reproductions of the beloved sculpture. Visbal told CNNMoney on Thursday that she's working on a line of 25 limited edition replicas of the statue. She declined to share how much they will cost, but she said the price is "substantial." She noted that the reproductions "are priced as iconic works." "I got so many inquiries on the full-size work," the artist said. She has sold three reproductions so far, including one that is already on display in Oslo, Norway. It's important to Visbal that the reproductions be placed in public places, on corporate campuses or in educational facilities so that the statue can continue spreading a message of gender equality. "I really just don't see selling it to someone who's going to put it in their backyard," she said. "They have to continue to spread the message about diversity." Otherwise, she said of the statue, "what good is she?" 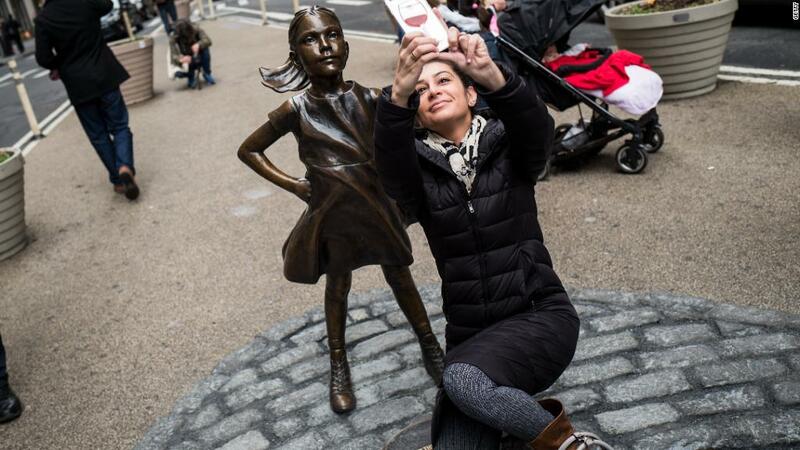 State Street Global Advisors, which commissioned the work to call attention to its efforts to add more women to corporate boards, holds the "Fearless Girl" trademark. The asset manager is not involved in the reproductions. Last month, Visbal announced that smaller versions of the bronze statue are available for purchase for $6,500 each. Twenty percent of proceeds will go to charity, she said. Visbal knows that the price tag puts even the smaller reproductions out of reach for many, and hopes to be able to offer more affordable versions of the "Fearless Girl" statue one day. Eventually, she'd like to make jewelry, t-shirts and dolls and write children's books featuring the "Fearless Girl" figure. The original statue has been standing opposite Wall Street's "Charging Bull" for over a year. The statue has become immensely popular in that time, drawing crowds of people who see the bronze girl who stands with hands on hips and chin held high as a symbol of empowerment. On Thursday, SSGA and the New York City mayor's office announced that the roughly four-foot-tall bronze statue will move to face the New York Stock Exchange by the end of the year. The city added that the "Charging Bull" may move as well, but didn't specify where or when. Visbal is happy that "Fearless Girl" is staying in New York City, and doesn't think that it needs to stand opposite the bull. 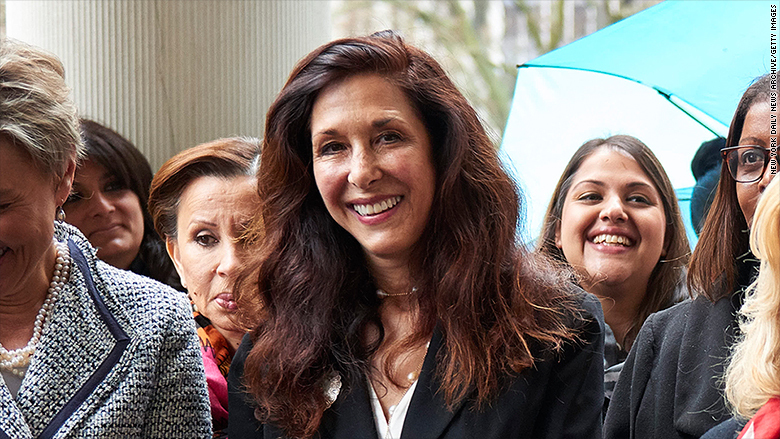 "I've always felt strongly that she can stand on her own," Visbal said. "Her message goes far beyond the corporate environment," she added. Arturo Di Modica, the sculptor of the "Charging Bull," has criticized "Fearless Girl." Di Modica said last year that the statue changes the message of his art, which is "a better America and a better world." Visbal disagrees. "We added a new meaning to 'Charging Bull,' but we didn't change 'Charging Bull,'" she said. "I've always been firm about that." "Fearless Girl" has also received criticism from people who see the statue as an attempt by SSGA to cover up a spotty record on pay equity. Last year, the company agreed to pay $5 million to settle allegations that it underpaid female and black employees. The firm denied wrongdoing. But Visbal doesn't see "Fearless Girl" as corporate art -— she sees the statue as a much-needed symbol. "She represents what any little girl could become," Visbal said. "The message may have begun as a statement about Wall Street," the artist added. But the statue "has taken on a life of her own."